The GOP presidential candidates, at the upcoming ABC News debate in Iowa, should brace themselves to be splattered with tough questions from the left from moderator George Stephanopoulos. The good news for them is that most should be well-prepared for the left-leaning sliders, as many have already been subjected to Stephanopoulos’s liberal questioning on Good Morning America. In 20 interview segments this year with the GOP candidates, totaling nearly two hours (110 minutes), an MRC review has documented Stephanopoulos has consistently pressed his guests from the left. Of questions with an ideological bent 75 percent (36) were from the left with just 25 percent (12) of them coming from the right. When current GOP frontrunner Newt Gingrich showed up on the January 18 edition of Good Morning America, Stephanopoulos prodded the former Speaker of the House if he was prepared to put 129 million Americans at “risk” with his opposition to Obamacare. STEPHANOPOULOS: A new study being released by the Department of Health and Human Services that says up to 129 million Americans, half the non-elderly population, could have health problems that could lead insurers to either raise prices or deny coverage. If President Obama’s reform is repealed, they say that’s going to put these people at risk. Are you willing to take that risk for the 129 million Americans? 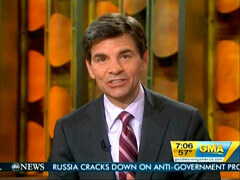 STEPHANOPOULOS: Well, let’s talk about the poll numbers, just out this morning. That seems to be very strong support for President Obama's position in this budget fight and a rebuke of the House Republican position. STEPHANOPOULOS: But every bit helps, doesn’t it? STEPHANOPOULOS: You say that everyone needs to be involved. And I think that’s reflected also in those numbers. A lot of Americans look at those numbers and say it’s wrong for seniors who rely on Medicare to get cuts when wealthy people get tax cuts extended. 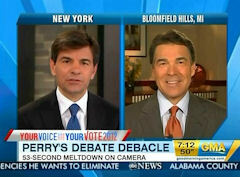 Stephanopoulos portrayed another GOP candidate, Ron Paul, as an uncompassionate villain of flood victims when he passed along an audience viewer’s question on the May 13 edition of Good Morning America. STEPHANOPOULOS: Your 9-9-9 plan, scrap the tax code, replace it with a 9% income tax, 9% corporate tax, 9% sales tax, got hit by everybody on the stage last night. And, and one of the most striking moments, when they panned out to the crowd and asked about the 9-9-9 tax, not a single person raised their hand in support. And I wonder if that's because, you know, when people look at the nine cents sales tax, you're gonna spend another nine cents every time they spend a dollar. That’s gonna be a huge hit to Americans who are hurting right now, isn’t it?...A lot of independent analysts have looked at it, have looked at this plan as well, and they say that this would be a huge tax cut for the wealthiest Americans, a real tax increase for poor and middle class Americans, and it's gonna increase the deficit. Apart from questions tilted ideologically to the left, Stephanopoulos used his interviews to play up the Republican candidates’ weaknesses and foibles. While he actually asked Mitt Romney, on the February 1 Good Morning America, a few questions from the right he did so to underline his chief weakness among Republican voters. STEPHANOPOULOS: Even Karl Rove, President Bush’s former advisor, has said that unless you find a way- that the number one challenge to you getting the nomination in the Republican Party is your support for this individual mandate...You not going to apologize for the individual mandate? STEPHANOPOULOS: Larry Sabato, presidential scholar already calling this the worst moment in modern primary debates. You’ve got a host of Republican operatives out overnight saying this is a death blow to your campaign. Viewers of a Republican debate don’t expect softball questions to be thrown at the participants but they would hope any tough questions came mostly from the right. However, as his recent interviews with GOP candidates on Good Morning America indicate, that is a task the former Democratic White House spinner to Bill Clinton seems unable or unwilling to handle.